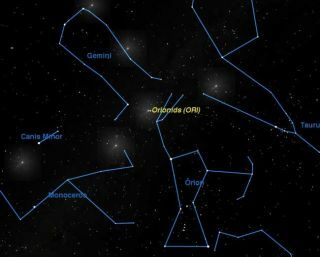 The Orionid meteor shower, one of the biggest and brightestof the year, is at its peak Wednesday morning, Oct. 21. Skywatchers with dark skies and good weather could see ashooting star every 5 to 10 minutes, with brief bouts that might prove busier. The Orionids, like most meteor showers,are caused by particles associated with a comet, in this case, the famousHalley?s Comet. If you can?t wait until Halley?s Comet makes its next appearancein 2062, this is your chance to see a piece of it as it flies across the skyand vaporizes in Earth?s upper atmosphere. While most annual meteor showers are pretty minor eventsfor the casual observer, the Orionids are one of the two or three best in theyear, especially as this year there will be no moon to interfere with seeingthe fainter meteors. The Orionids typically produce about 15 to 20 meteors perhour at their peak, for skywatchers with dark skies. Expect an additional fiveto 10 sporadic meteors per hour ? those not related to the shower. Urban andsuburban residents will see far fewer, however, due to local lightpollution. Although you can probably see a few of the brighter meteorsjust about anywhere, weather permitting, a trip to dark skies free of lightpollution will reward you with many fainter meteors. The other trick with all meteor observingis to wait until after local midnight to start observing. By then the radiant,the point in the sky from which the meteors appear to come, will be highoverhead. Be sure to dress warmly, as it will be chilly. A bit more about the radiant: When you look into theradiant, you are actually looking directly at the point from which all themeteors are coming. In the case of the Orionids, this is a point just overOrion?s left shoulder, close to where he?s holding his club, and just betweenthe feet of the Gemini twins. You?re looking directly into the orbital path ofHalley?s Comet. When you?re actually observing, you don?t need to knowexactly where the radiant is, or look directly at it, as the meteors can appearanywhere in the sky, radiating out collectively like spokes from the hub of awheel. In fact the longest and fastest meteors will be about 90 degrees awayfrom the radiant. The Earth passes through the orbit of Halley?sComet twice each year, the other time being May 6. There is aweak meteor shower associated with this date, the Eta Aquarids, but it isnowhere near as spectacular as this week?s Orionids. You can start to watch for this shower late Tuesdaynight, heading into Wednesday morning. But don't expect the evening session tobe as fruitful as the early morning viewing. The shower's maximum activity ?from the heart of the cosmic debris stream ? will occur at 6 a.m. EDTWednesday, just before dawn in eastern North America. So the best viewing timeswill be just before dawn in the eastern part of the country, and around 3 a.m.out West.